Vic 56 is technically a steam coasting lighter or a "puffer". She is one of the 98 Victualling Inshore Craft built to the orders of the Ministry of War Transport between 1941 and 1945, which were a part of the enormous Government wartime ship-building programme. Launched at Faversham in 1945, VIC 56 (like many of the other VICs) when built, had an open navigating platform (the wheelhouse was added later by the Admiralty). The boiler was of a convertible coal/oil design and, presumably in view of coal shortages, she and the VIC 57 were completed as oil burners, and so the VIC 56 remained until 1980 when the decision was taken to convert to coal firing in view of her expensive oil consumption. The only other major change was to remove the 2 ton capacity steel cargo derrick and to fit a wooden one which could be used to lower a boat by hand. 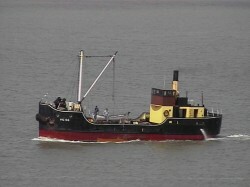 Otherwise VIC 56 remains in substance and internally as she did when operated by the Port Auxiliary Service. The early use of VIC 56 is unclear; she was given a loadline certificate by Lloyds (not necessary for naval vessels), allowing her to trade around the British Isles, except for the west coast of Ireland. By 1947 she was allocated to the Victualling Store Officer, Rosyth and so began a 30 year life spent almost entirely in the Firth of Forth, taking stores and ammunition between Rosyth and Crombie, and on occasion to Leith and Port Edgar, and also to Bandeath near Stirling. She was due to be disposed in September 1978, but was bought for preservation the present private owner.After being moored for many years near the East India Dock in the Autumn of 2005 VIC 56 moved to a berth at Chatham Historic Dockyard.